Overseeing your first roof repair or replacement project can be very challenging. 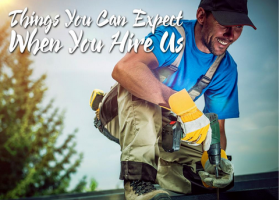 In our experience as one of the leading roofers in Northwest Indiana, we know the importance of having a reliable, consistent, and professional roofer keeping everything on track. Our team assures you that the process will be smooth and easy, so you can focus on more important matters. Here are six things you can expect from us.